After my vocal surgery on Monday, May 12th, I spent 4 days in complete vocal silence–no talking, no singing, no clearing my throat, no LOL (laughing out loud). That also meant no “I love yous” to my wife or kids. No “goodnights.” No “good mornings.” I even had a special message on the unlock screen of my phone (picture below) so I could inform people that I wasn’t just being rude when I didn’t speak to them. I did pre-record “I love you,” “goodnight,” “good morning” and a few other handy phrases in the Voice Memo app on my phone. My iPad served as my dry erase board when I needed to communicate. I also got by with charades (often, humorous) and sign language–I know most of the ASL alphabet (also humorous). A text-to-speech app was somewhat useful, but if I was involved in a conversation, usually by the time I had what I wanted to say typed, the subject had changed. The most interesting time for communication was days 5-7 when I could speak 1 or 2 words at a time occasionally throughout the day. I found myself distilling my thoughts down to 2 words. After 4 days of silence, my first 2 words were saved for Suzanne: “love you.” That night, the whole family was gathered so I could say, “g’night, loveya.” (That’s 2 words, right?) According to Proverbs 17:27, I am pretty smart: “The one who has knowledge uses words with restraint…” Just kidding! It was actually easier to be totally silent than it was to speak at a level 2 (talkativeness scale from 1 to 7 with an average person being a 4). Suzanne and I went to a pastors and wives retreat during that time and it was difficult to be someone who “uses words with restraint”! I tend to be more of an introvert, but the retreat was held by the discipleship organization 3DM that we have been involved in for the past 2 years. It was difficult to restrain my words in talking with other leaders about my passion–discipleship! Having to restrain my words did cause me to ponder what our world would be like if words were in limited supply. Ecclesiastes 5:2 says, “Do not be quick with your mouth, do not be hasty in your heart to utter anything before God. God is in heaven and you are on earth, so let your words be few.” What if we only had a limited number of words we could say everyday? I’d like to think that gossip would become much less of an issue. Maybe people would be more trustworthy. One thing is for sure–if words were in limited supply, much more thinking would occur before speaking. And there would probably be much less hurt caused to others by our words. Are you willing to say with Solomon–the wisest man who ever lived–“let my words be few”? I guess it’s a good thing I’m an introvert, because it really hasn’t been that hard for me to be silent. It’s hard to not say “I love you” to your wife and kids, but at least they understand and they have your best interest at heart–they don’t want you to speak! The hard part is walking into a store by yourself and having to interact with salespeople. 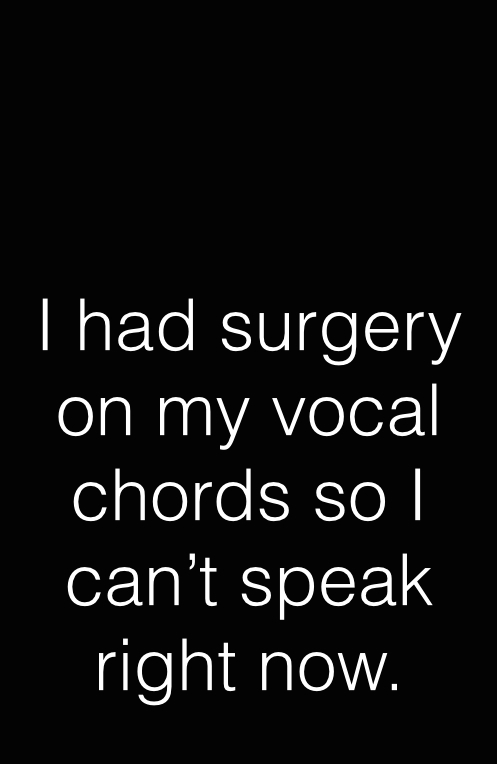 I created a simple message on the unlock screen of my iPhone that says, “I had surgery on my vocal cords so I can’t speak right now.” That way I can quickly flash my phone to someone so they know I’m not being rude! The most awkward part is when you see people you know who also know you can’t speak but they just want to be nice and stand next to you. There’s this awkward silence because they don’t want to ask you any questions, but they don’t want to just walk away from you either! The surgery appears to have been as successful as the surgeon had hoped–at least that’s what he told Suzanne. Although they sent me home with a prescription for liquid Vicodin, we never filled it. I’ve only taken a couple of Tylenol on two evenings before I went to bed so I could sleep without any pain. From the time I woke up from surgery, I had a sore throat–about like you’d have from a nasty cold. Each day it has gotten less severe and today, it feels practically normal. The most encouraging thing has been all of the people sending texts, emails, Facebook messages, phone calls (to my wife), just to check up on me. It really has been wonderful to be on the receiving end of care from the Body of Christ. People have brought delicious meals and given us little care packages and we are all so appreciative of the demonstrations of love we have received! It looks like I’ve definitely entered into a season of abiding even if it was forced up on me by a vocal polyp. Our rhythms have definitely changed. Now we just have to learn how to keep our rhythms a little more in balance. Thankfully, we’re headed into the summer months with school out and vacations on the calendar. I’m thankful for the time to be still and know that He is God!